The G-Suite tool for Project Based Learning. Encourage and enhance collaboration and peer tutoring by embedding everyday tasks into a project. By focusing on the collaboration process, TeamLearn enables teachers to position themselves as mentors who facilitate knowledge sharing between the students . This product, though in its pilot phase, seems to be ready to explode with growth! Mobile, tablet, Mac, PC, Chromebook. Web-based mobile first design. Students see the content of the tasks without exiting the application at the risk of losing focus. YouTube videos, images and websites are embedded directly in the cards. Individual Kanban boards for each project group. Teacher dashboard with aggregated view of whole class. Create your first board in 30 seconds. Intuitive user interface. Hassle free sign-in for teachers and students, no extra password to remember. Web-based, no installation. Contextualized chat for each task. Teacher dashboard visualizes team progress in real-time. Sign in with your Gmail or Google Apps for Education Account. All data stored on your Google Drive. Sharing and security based on standard Google Docs sharing. Lets students investigate and respond toan authentic, engaging and complex questions, problems, or challenges. Online and offline, head, heart and hands. Create digital tasks and keep track of non-digital ones. The now and here is combined with later and anywhere. 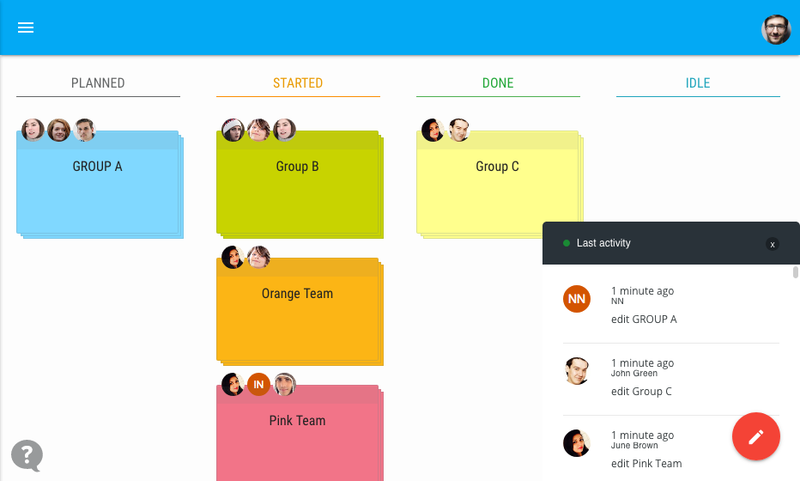 TeamLearn supports both in-class and remote/ homework tasks.